Everyone has their own escape mechanisms at the end of a long day at work – some choose to turn towards music and movies while others may focus on the finer cuisines that surround them. But if I had to give you one advice on how to bring a smile to your face, it would simply be this – get a dog. During bad times in our home, the one constant that remains unfazed through the murky haze is that adorable munchkin, Snoopy. He entered our house at the age of 40 days and is closer to two years now but he still does not cease to bring a smile to our face with his antics. But it goes beyond him being silly – it is the selfless love that he shares every day without fail that truly make him a priceless part of the family. One very peculiar aspect (among many, I agree!) regarding Snoopy is his eating habits. Like most beagles, he is a voracious eater and often ends up stealing even from the doberman’s bowl of food at times! He knows who the weaklings are in the house too; the ones most likely to share their food should he beg. But does that mean he gives up on food that he knows does not belong to him? Well, as it turns out, yes and no. The last time I came home, as always Snoopy was overjoyed to see me. He knows the routine of the house well by now and anticipates our meal times better than us. This time though, we all got slightly delayed because of a discussion that was going on in the living room. I recall my mother mentioning that food had been served at the dining table but had forgotten all about it, engrossed in the conversation. It was only about ten minutes later that we realized that Snoopy was nowhere to be seen. You don’t have to be a rocket scientist to guess where his nose would have led him. When he refused to come when we called out his name, we rushed to the dining room. The sight that we saw left us laughing instead of enraged. 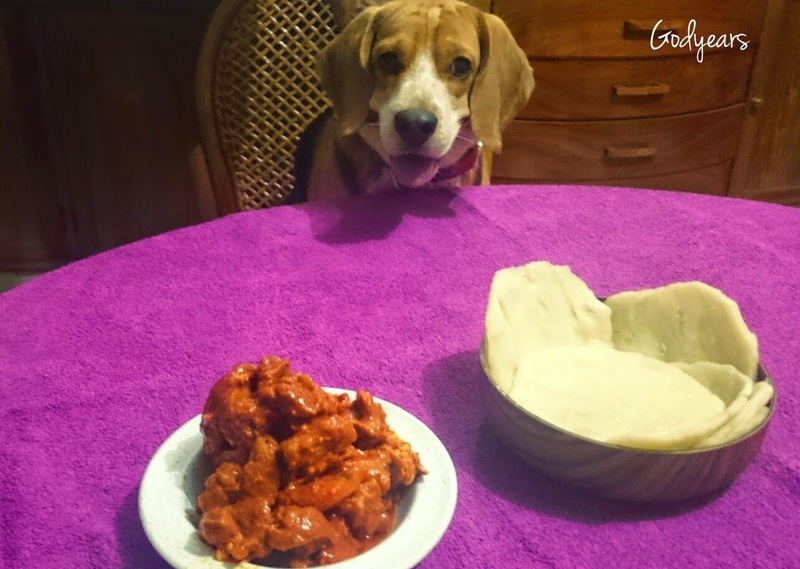 There Snoopy was, sitting on a chair patiently, with the plate of mutton and rotis right in front of him. While he was staring hungrily at it, he still wanted to get a fair share without getting into trouble with us so he just patiently waited at the table for all of us to start so that he could start flashing those “puppy dog” eyes of his. He was so sure he was going to get his quota he did not even feel the need to steal anymore from us. Coming right off an intense discussion, the sight of him stealing our food could have resulted in us scolding him rougher than he deserved. Instead, his innate belief in us to give our food to him willingly diffused the tension in the room and got us all laughing. He even posed for pictures as you can see while he awaited a plate for him too! You may call Snoopy optimistic but damn! That dog was self-assured, if you ask me. There is a lot you can learn from dogs - it is easy to give in to personal temptations when you feel you can get away with it but sometimes you just have to have faith that if you do the right thing, you will win in the end. Its so simple a lesson, even dogs know it. When did we forget? When I see Snoopy and how much he has matured over the years, I know that he will bring happiness and joy to all who meet him. And I am also happy because I know that like him, a million other Snoopys exist around the world, making people smile every day with their unique antics. And yes, in case you are wondering, he did get his share of bones at the end of the meal. What can I say? He knows us too well. This post was written for Housing.